This report is the first of its kind to examine the racial disparities in news and media opinion coverage of families. Color Of Change, the nation’s largest online racial justice organization, and Family Story, an organization dedicated to elevating stories of diverse families, have released a new report examining the news media’s systemic and harmful misrepresentation of Black families during the last election cycle. Conducted by the University of Illinois at Urbana-Champaign Professor of Communication, Travis Dixon, the report examines relevant stories published or aired from January 2015 to December 2016, encompassing news coverage from national broadcast news outlets, cable news outlets, national mainstream newspapers, and conservative blog sites. 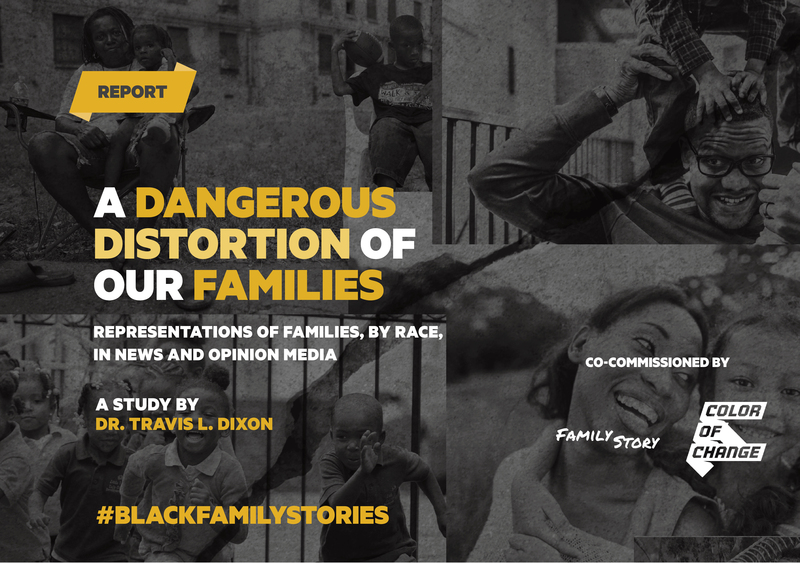 Across all media categories, the report documented how news and opinion media outlets systemically and inaccurately portray Black families as more poor, criminal, and unstable than white families. In addition to conservative media outlets, mainstream media outlets also systemically and inaccurately portray Black families. CNN’s portrayal of poor families is a 7 (Black families) to 0 (white families) ratio, Fox News is 8 (Black families) to 1 (white families). ABC’s description of families as a source of social stability is a 16 (white families) to 2 (Black families) ratio. “News and opinion media continue to reinforce the unfounded and unfair idea that Black families are sources of personal, cultural and societal instability and that they are responsible for poverty, welfare and crime, rather than those who shape the economic and social environment families live in” said Nicole Rodgers, Founder and Executive Director of Family Story. Media outlets must stop propagating negative stereotypes that do not have basis in fact. Media outlets must revise their standards and protocols for reporting on families and race-related issues. Media outlets must include people of color in the editorial process.